This is my veggie take on an old Italian classic and a dish that everyone is familiar with: Lasagna. 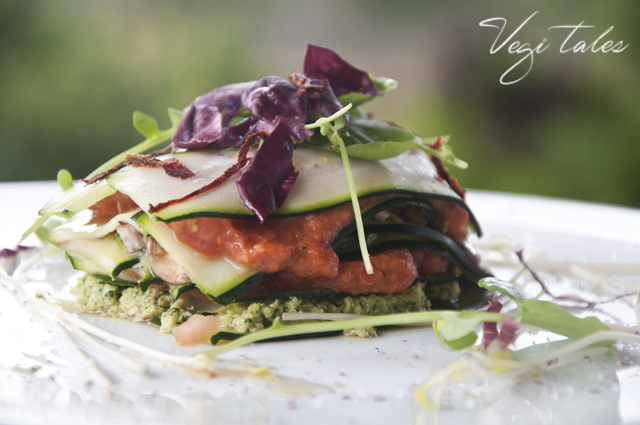 It’s all about the layering, those different elements and colourful components make the dish a more complex one, yet definitely one worth sharing with friends and family, and it’s a good example of how playful und creative raw vegan cuisine can be. 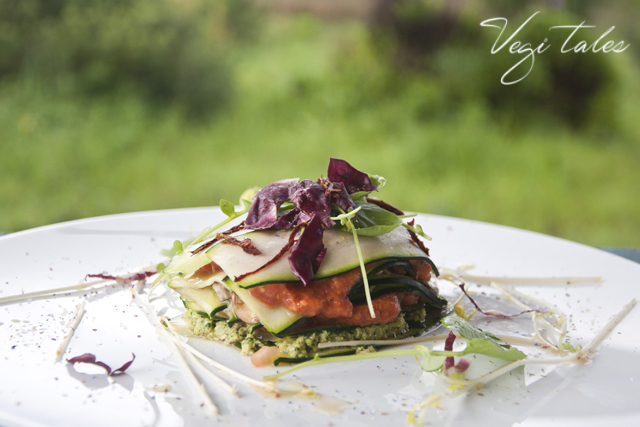 In order to prepare the lasagna you will need a mandolin to slice the zucchini, a food processor or high speed blender, organic vegetables, a selection of nuts and a little creativity to decorate your plate. Cut your Zucchini once crosswise in the middle, especially when you've purchased longer ones. Then, using a mandolin, slice all the zucchini and lay slices out evenly in a container (preferably glass). Add the rest of the ingredients, massaging them well onto the Zucchini slices and then cover and set aside to marinate for a minimum of 2 hours. Cut the mushrooms into very fine slices. You can use the mandolin for this as well or a sharp chef knife. Finely cut the ginger and garlic, then adding it together with the mushrooms and the rest of the ingredients in a glass container. Mix all and set aside to marinate for a minimum of 2 hours. Add all your ingredients to a food processor or high speed blender and mix for a few seconds, so the texture is still crunchy, not creamy. Then set aside. Add all your ingredients, except for the water, to a food processor or high speed blender. Add water slowly while mixing until you have a smooth and creamy texture (as desired). I added about 1/8 cup. 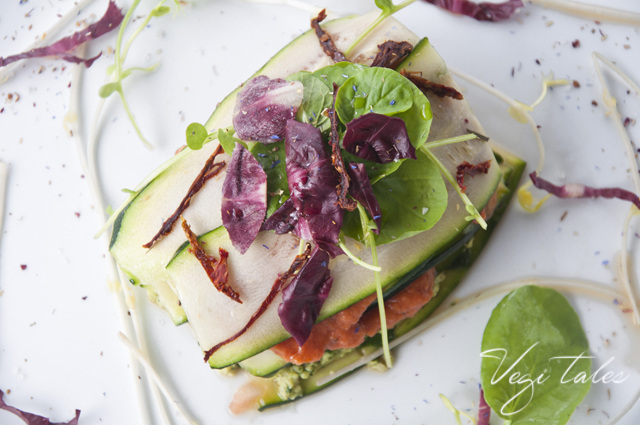 Once all the components are prepared you can start assembling the lasagna layer per layer, using the marinated Zucchini as your bottom and top layer and in-between all other fillings. Overlap the Zucchini stripes a bit when laying them out on the plate, it helps holding everything well together. As a first filling layer you can use the marinated mushrooms on a bed of spinach leaves, as a second filling layer you can use the pesto, then the tomato sauce and then the cashew cheese, but feel free to find your own way with this and repeat certain layers as you please and depending on how thick your lasagna shall be. Enjoy! I recommend marinating the zucchini and mushrooms over night. The flavors will have time to set and your lasagna will be more tasty! As usual, using fresh and organic ingredients will highly increase the taste and quality of your dish. It's not recommended, especially when preparing raw dishes, to use produce that has been sprayed or was else treated with chemicals.